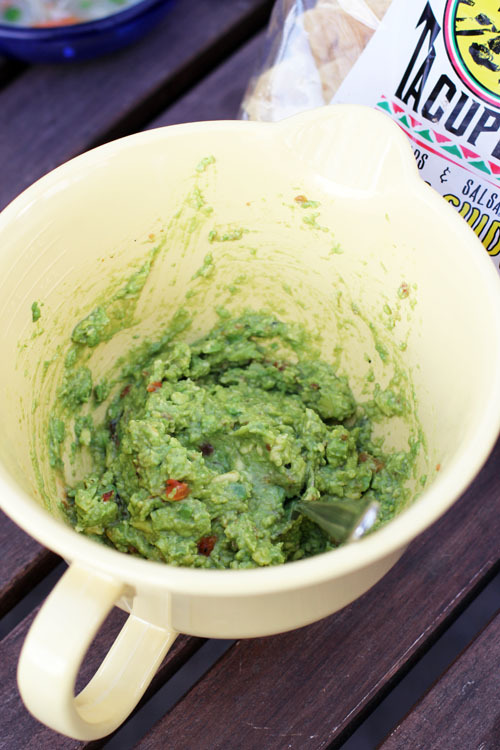 Time to make some guacamole, the perfect 4th of July dip! Okay, maybe more appropriate for Cinco de Mayo, but whatever. I have a few tips I’d like to share that will cut down on prep time and pump up the flavor. Click here for a great way to cut open avocados and remove the pits safely and quickly. Use a pastry blender to mix it up. It’s perfect for mashing up the avocado, but keeps you from overmixing. You don’t want to overmix – chunkier is better. Pasty, not so good. Salsa is my “secret” ingredient – you get hunks of tomato, onion and pepper, but you don’t have to do any chopping. And it adds nice flavor. About the cilantro – I almost never have fresh cilantro on hand. The guac is delicious without it, I promise. But if you DO have it, it adds a nice fresh flavor. Make sure you salt the guac enough. This is important. Add a little bit at a time so you don’t oversalt. You can tell when an avocado is ready because it’s soft to the touch (not too soft! ), often darker in color, and when you pop the little stem thingy off the end, it will be green in the hole. Lemon and lime juice do NOT keep your guacamole from going brown. I use lime juice just because it tastes good. Putting the pit in the guacamole will NOT keep it from going brown. The reason avocados go brown is from contact with oxygen. The best way to keep it green is to put plastic wrap directly on the guac when you store it. It’s still going to go a little brown on you. There’s just no getting around that. The brown is a-okay to eat, but you can always skim it off the top if you don’t like how it looks. I’m telling you, my guacamole is GOOD. It’s EASY. You can make it with whatever you have in the cupboard and fridge. I always have lime juice & salsa in the fridge and spices in the cupboard. All I need is the avocados and I’m set! Thanks Jane! I was so going to ask you to do a call-out for guacamole recipes and here you are reading my mind! thanks! and yum! I have a ripe avocado on the counter right now. I think I’ll whip up a little batch for tomorrow. Thanks! One of my old roommates used to put in about a tablespoon of mayo. It can make the guacamole seem heavier, but it’s great if your avocados are a little on the green side. ~This is just an estimate”¦ you want the end product to have a slight pinkish/red tint. Mix all ingredients, cutting in the avocado and cream cheese so you have a chunky mixture. Thanks for having such a fabulous site! this is exactly how we make our guac too. with the salsa. and you are right on w/ the lime juice.. I like to use beacuse it tastes different (and better) than the lemon. yum yum.